Self-doubt has a way of penetrating into the deepest corners of your life, so when Zoë Clark’s fiancé dumps her after 10 years together (and on the eve of their wedding! ), she immediately becomes more hesitant about most aspects of her life. Her near-bipolar boss doesn’t help matters either, and that, combined with a sudden raise in her rent, has her flailing for a lifeline. So when she receives a bouquet of roses at her desk from a guy who works in the building opposite hers, she’s stunned. And when they start dating and Oscar starts showing himself to be more and more perfect, she’s thrilled. After years of mind-numbing, demeaning tasks while pursuing the perfect job match for her clients (she is a legal headhunter), she may have inadvertently stumbled across the ideal match for herself, but could Oscar possibly be as perfect as he seems? 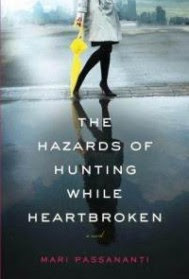 With "The Hazards of Hunting While Heartbroken," Mari Passananti has crafted an engaging and easy read about a girl learning to find her feet in the big city. The story is somewhat slow in the beginning, but once I got to the halfway point it definitely picked up and started to grab my attention a bit more. Ms Passananti’s writing style is engaging, and the parallel that’s built into the story between Zoë’s personal and professional life was certainly a nice touch. That being said, I was really hoping this book would grab me by the collar and demand my attention when I started reading it. Don’t get me wrong: I absolutely don’t regret reading it, and as the characters grew throughout the novel, it definitely blossomed as a story. I wish there had been perhaps a touch more character development nearer to the beginning, but maybe that’s just my need for instant gratification kicking in. The story works very well as it stands, too. This is a great read for a day when you can really sink into a novel. Ms Passananti builds an entire cast of characters who are believable and you really want to get to know a bit better. Even some of the bit players in this novel went through changes and metamorphoses, which I think helped the realism of this book. Everyone’s read those books where no one changes but the heroine, and that’s just not real life. With multiple moving parts, this book was more like real life than a few I’ve read, for sure. If you’ve ever wondered if your perfect guy is out there, this is definitely the book for you. The story of this one doesn't really catch me and I doubt I'd read it, but I absolutely adore that title. Plus, any book with a main character named Zoë (accent included!) gets bonus points, even if I won't be picking it up myself.